So I’m a numbers nerd. I was doing some math and it looks like I’ve got 15 more years of the “busy back-to-school season” ahead of me. I’m 8 years in (with the early intervention pre-school my oldest attended) with 15 more to go. 22 years of someone starting school. That’s a lot of busy, right there. And there’s no better partner to help me survive all this busy than General Mills Cereals. I’ve teamed up with them this summer to help you break through the busy too. 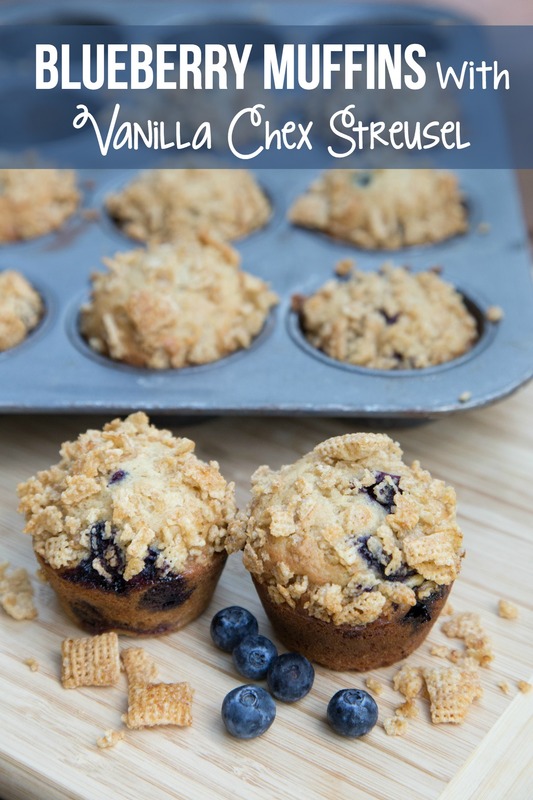 And I’ve already got 2 times on my calendar to get my freezer loaded with “Grab ‘n Go” Breakfasts…like these amazing Blueberry Muffins with Vanilla Chex Streusel. Grab n Go’ Breakfasts Are the Best Way to Survive Back-to-School Mornings! I set aside time to get homemade snacks and breakfasts made in the freezer, so I can start off on the right foot for the year. The more you can plan ahead – the more time and money you’ll save. Oh, and sanity too! When we’re not having these warm blueberry muffins slathered with butter, we’re probably pouring a bowl of Chex or Cheerios. Toss in some yogurt and an easy piece of fruit (like banana or mandarin orange) and breakfast is a cinch for me! Back in 2009, I visited General Mills and spent a few days there in their food photography lab, their test kitchens, and I was quite impressed with how in tune they were with their customers and what kinds of new products they were working on and the improvements they were/are making with existing products. At that time, they were about to roll out their line of gluten-free Chex cereals! Today, the latest news from General Mills is 90% of the company’s cereal recipes do not have artificial flavors and or colors from artificial sources, and they are using real ingredients like honey for Honey Nut Cheerios, cocoa for Cocoa Puffs and Reese’s Puffs, and cinnamon for Cinnamon Toast Crunch. Wet ingredients. Make super smooth with your whisk. Homemade Muffin Pro Tip: Mix in 1/2 cup flour at a time for smoothest batter. Blueberry Muffin Pro Tip: Coat the blueberries in flour (or even powdered sugar!) to keep them from sinking to the bottom of the muffin. And coat it in melted butter. Go ahead and eat a spoonful…it’s delightful. Add the Vanilla Chex Streusel onto the muffin batter and press gently. Bake. Your house will smell like a cookie candle. It’s the Vanilla Chex & butter…having an olfactory party in the oven. Let cool slightly before breaking open and slathering with butter. YYYUUUUMMMMMM. Your turn to make them now! Preheat oven to 375 F. Lightly grease 12 muffin tin wells with non-stick cooking spray. In a large mixing bowl, whisk together the 2 sugars, eggs, sour cream, vanilla and oil. Mix until smooth. Add 2 cups of flour – 1/2 cup at a time – into the batter, then mix in the baking soda and salt. 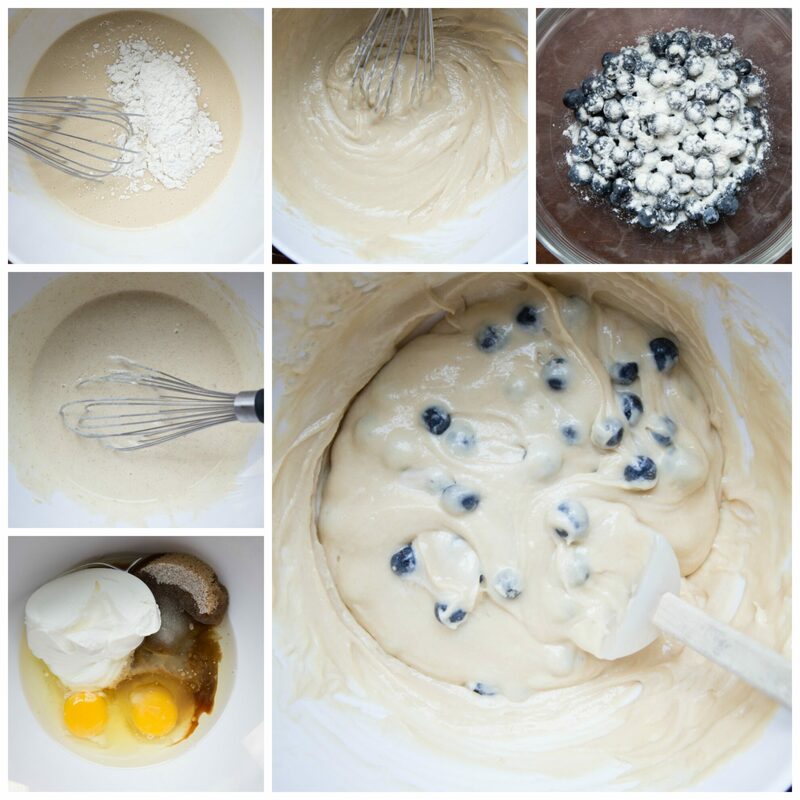 In another small bowl, toss the blueberries and 1 Tbsp flour. 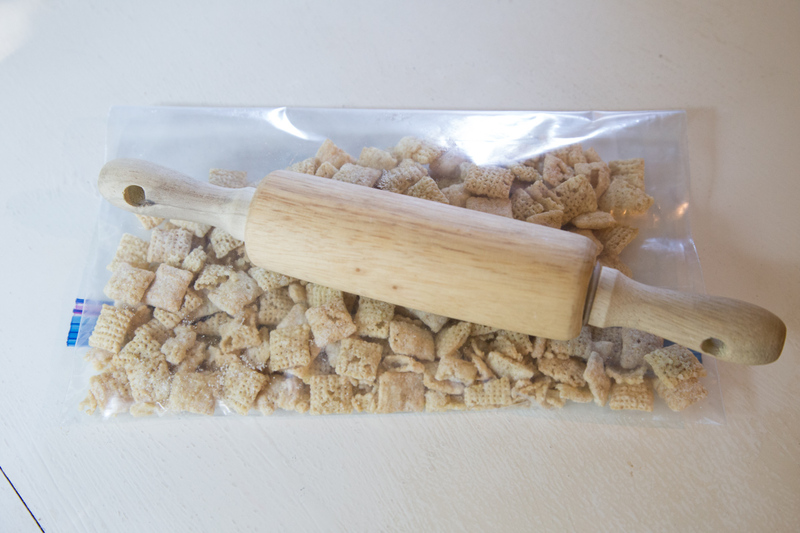 Melt the butter and toss with the crushed Vanilla Chex cereal. Spoon the batter into the greased muffin tins and top with the “Vanilla Chex Streusel” and press lightly into the batter. Bake in the preheated oven for 22 to 24 minutes. 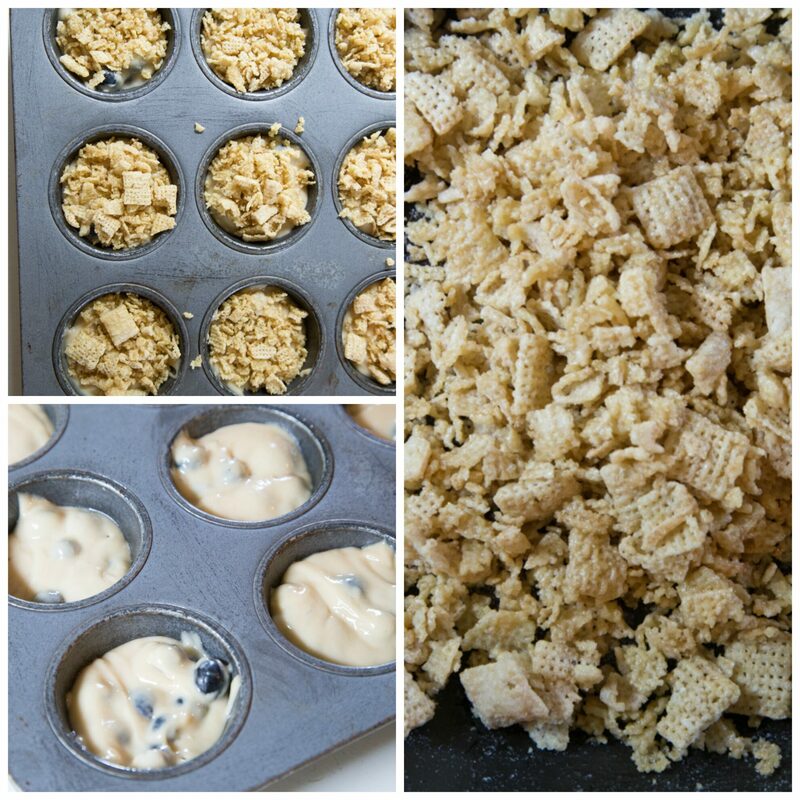 Serve Blueberry Muffins with Vanilla Chex Streusel, warm with butter. Disclosure: This post is sponsored by General Mills Cereals. Recipe is my own. Opinions and busy-ness of life are my own too.